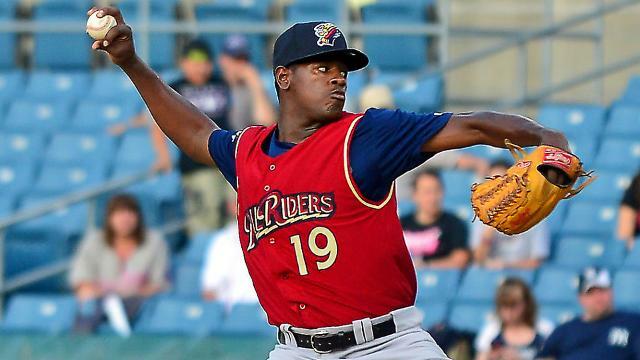 Yankees top prospect Luis Severino was back on the mound Friday night and he tossed yet another gem. The 21-year old right-hander has raced through the ranks of the Yankees minor league system and has rapidly reached triple-A. After dominating hitters at every minor league level since 2012, Severino’s success has dragged over into the closest level he could possibly be to the major leagues. Since joining the Yankees system in 2012, Severino’s highest ERA in one total season in the minor leagues is a miniscule 2.54. The number pops out literally due to the sheer dominance exhibited by his earned run average. Severino’s earned run averages since 2012 are as follows: 1.68, 2.45, 2.46, and 2.54. Severino’s ability to keep runners from scoring has helped him leap into the ace-status of every staff he’s been a part of as it has also propelled him to becoming one of the best prospects baseball has to offer. In addition to a low earned run average, Severino’s walks plus hits per innings pitched (WHIP) has never been above 1.07 in his years in the minor leagues. As a matter of fact, it appears as though the high Luis Severino rises in the farm system, the lower his WHIP gets as it sits at just 1.02 this season. So now you’re probably thinking that Severino can do it all – because he can. Severino’s repertoire consists of his best pitch – fastball – which regularly sits in the mid 90’s and can reach up to 99 miles per hour. Severino’s primary strikeout pitch is the changeup which is considered a plus pitch with the potential to get even better. If he can perfect his slider, the sky is the limit for the small but yet hard throwing youngster. Despite the areas of improvement needed for Severino, that didn’t stop him from throwing 7 innings allowing 3 hits and no runs walking two and striking out six on Friday. And what about the start before that? Oh, Severino only went 7.2 innings, allowing 4 hits, 2 runs (both unearned) while striking out 7 without a walk. That, my friend, is what dominance looks like at the minor league level. So with the young, live arm and utter dominance exhibited in the minor leagues, it’s no surprise the other major league teams are salivating at the chance to get this kid. If I’m Brian Cashman, there is no way I trade Luis Severino (or Aaron Judge, for that matter) due to the superstar status they are growing into. This may prevent the Yankees for getting Johnny Cueto or Cole Hamels at the trade deadline. Although I’d absolutely love to have either one of them, if it means trading Severino, Judge or Greg Bird, that’ll be incredibly disappointing to not only myself but many other Yankee fans as well. If you’re like me, you used to not be that way. If you’re like me, you and I used to be completely open to trading away prospects for proven major league talent. And although that’s not a bad idea for a team with a serious shot to win the World Series, it is irresponsible for the Yankees to trade away top prospects at this point. I absolutely expect and hope to see this year’s Yankee squad playing in October. And in October, anything can happen and with the Yankees pitching, they stack up pretty well against teams in a 5 or 7 game series. But in a slight and subtle rebuilding mode, the Yankees can become serious contenders in 2016 and 2017 barring they hold onto their top prospects. Due to Severino’s youth and need for polishing his secondary pitches, it would be unrealistic to see him thrown into the inconsistent Yankee bullpen this season – until September, at least. I wouldn’t have foreseen this at the beginning of the year, but my realistic prediction is that he’s on the 40-man roster in September thus forcing the Yankees hand to bring him up for the final month of the season. If he’s not on the major league ball club when the September call-ups are brought up, we will all have to wait for him to reach our expectations of him dawning Yankee pinstripes, full time in 2016 – his estimated time arrival in the MLB.